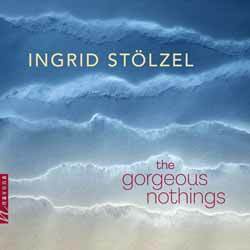 The Gorgeous Nothing is a beautifully rich album which wonderfully showcases Ingrid Stölzel's various compositional styles. But, unless you're a lover of all styles of classical music, there are likely to be segments here that you won't get on with. For starters, those that don't like operatic-style vocals won't get a lot of joy out of the opening five part 'The Gorgeous Nothing' (9 min, 29 sec). This is followed by the intricate, moving 'Here There' (8 min, 17 sec) for violin and piano; the three-part 'Soul Journey' (12 min, 59 sec - in which the singing returns) and the two final pieces 'With Eyes Open' (9 min, 40 sec - for alto saxophone and piano and 'The Road is All' (12 min, 07 sec - for violin, cello and piano). Emotionally this is a complex and deeply satisfying album. The diversity of styles help to keep this fresh and showcase Stölzel's talents as an energetic and, at times, melancholic writer. The end result is emotionally draining and deeply satisfying. The album closes with, arguably, this collection's most beautiful piece. 'The Road is All', which leaves you wishing that there was more... much more... Another winner from Navona Records.